About two and half weeks ago, my Xbox 360 gave me a Red Ring of Death, indicative of a general hardware failure. It’s about two years old now, and there weren’t really any warning signs. I went to turn it on, and….it didn’t. Most RRoDs are caused by overheating; I generally keep my 360 well-ventilated, and I definitely don’t leave it running for long periods of time when I’m not playing it. I’m going to chalk this one up to poor hardware design and workmanship. I immediately called 1-800-4MYXBOX. Boy were they unhelpful. The automated voice-activated menus were a pain to work through, and I had to repeat myself several times to get what I wanted. Why can’t we just have a plain old “Press 1” instead of say “Three flashing red lights”? It’s easier for everyone. After wasting my time with that, I instead went to xbox.com/support and had a much easier time. It took me less than five minutes to file a support ticket and print out a pre-paid shipping label (I also had the option of getting a box shipped to me, but that would have taken longer obviously). No human interaction required. The next morning I brought my 360 down to the UPS Store and had it shipped off to the repair center in Mesquite, Texas. It took about a week to get there, a couple days to get fixed, and another week to come home. Now it’s back to Mega Man 9! I’ve completed all 12/12 achievements (200 points) and 34/38 challenges. All I have left are “Beat the game without getting hit”, “beat the game while picking up only 8 energy capsules”, “beat the game 30 times”, and “beat every boss with 1 hit point left”. The Green Ring of Life is back, but for how long? 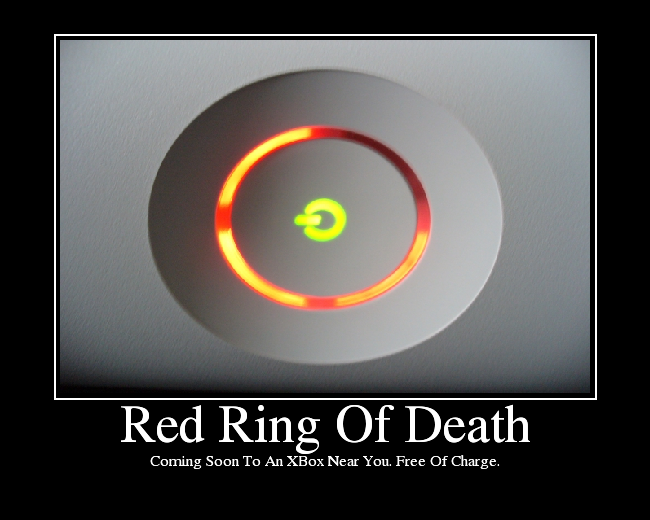 Have you heard about the new Xbox update that’s casuing the Red Ring of Death? So now they’re sending us hardware failures. Free of charge. Nice Article, actually I had fixed my xbox a day before by following a guide. I had shared a link here for those who are having this red ring of death. Although it appears all 4 lights are on at first glance, if you look closely, you’ll notice that the top-right light is distinctly unlit. It’s just not a very good photo. Actually, when you don’t plug in a video cable you get all 4 lights. I know you thought you could call somebody out on the net, but you failed. Thanks for playing! Nice article and It is really really easy to fix the RROD I wrote a post on people having problems with it. Hey man check this website out it’s got some good stuff on helping you to fix the RROD.